Looks like if you want to occupy Seattle Community Colleges, it’ll have to be by daylight. In a decision over an issue inspired by Occupy Seattle’s short stay on Capitol Hill’s Seattle Central Community College campus and debated for months now, the community colleges board of trustees voted to revise rules regarding protest on campus to restrict overnight camping. A statement released by SCC Chancellor, Jill Wakefield outlines the new provisions made to school policy in detail. The Seattle Times reports that a new group has formed that believes the rules may violate the First Amendment. Seattle Community Colleges have been the home of many protests in the past, but the Occupy Seattle encampments at SCCC last fall prompted the school to revisit its protest policies “to protect the health and safety of our campus communities,” according to the statement. Occupy Seattle took up residence at Pine and Broadway at the end of last October and while organizers may have done their best to keep the camp functioning and maintain a “good neighbor” set of rules, introducing a settlement of dozens of tents into a constricted space meant constant challenges for the group — and the Seattle Central campus. 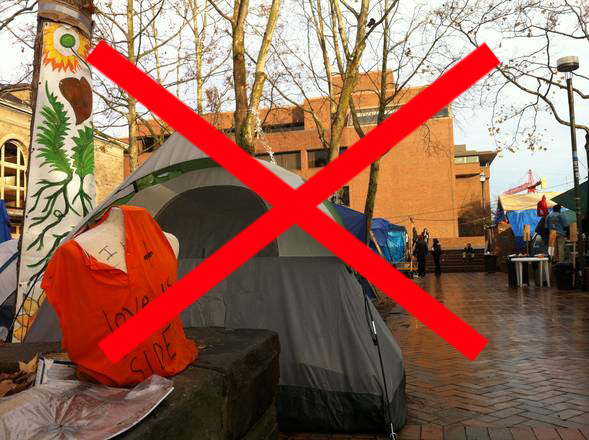 By November, the trustees passed an emergency rule banning Occupy’s camp from Seattle Central. The new protest rules come after public hearings that helped shape the newly decided policy. According to the trustees, voices from the community were responsible for the repeal of a proposed revision that would limit where on campuses groups could exercise First Amendment rights to specific areas. Community input will still be a factor in future First Amendment activities regarding SCC — a task force nominated throughout the district will meet for the first time this spring and work through December to more fully address free speech issues on campuses. Yesterday, our Board of Trustees approved a restriction on camping on our college campuses. This restriction was added to an existing section of the Washington Administrative Code (WAC 132F-136), which has been in place since 1984. This provision addresses issues of safety and security that were raised during the Occupy Seattle encampment last fall when the Thurston County Superior Court upheld an emergency rule prohibiting camping on our campuses. The ruling required the District to act quickly to permanently change this section of the Washington Administration Code to protect the health and safety of our campus communities. The May 17 Board action followed a long process of review and public comment. Members of our campus community spoke out at public hearings in March and April, when an earlier WAC concerning the use of facilities for First Amendment activities was first proposed. As a result, we pulled both that WAC and its related procedure (# 270), off the table and asked the Board to limit its review to camping restrictions. The Board heard public comments on the revised proposal at its last two board meetings. We still have work to do. As announced earlier this month, I am convening a task force to address the use of campus facilities for First Amendment activities. The group will examine our procedures to ensure we are meeting our commitment to the First Amendment as well as to the values that are integral to the delivery of education. Task force members were nominated from throughout our district. Their first meeting will be held this spring, and the group will conclude its work by December 2012. Thank you to the following individuals who have agreed to serve from the college community: Don Bissonnette, Ian Elliot, Rodolfo Franco, Kelly Grayson, Cessa Heard-Johnson, Tysen Hillquist, Larry Hopt, Hillery Jorgensen, Kenneth Lawson, Kimberly McRae, Orestes Monterecy, and Greg Morphew; as well as community leaders Al Sugiyama, Joan Weiss and an additional community member to be announced early next week. The Seattle Community Colleges stand for both safeguarding free speech and providing excellent education. I am confident that the task force will provide us with their best thinking. But don’t fret, OS has no desire to camp at SCCC. WTF are “first amendment activities”? The First Amendment to the U.S. Constitution doesn’t define activities; it prohibits laws which infringe upon certain rights with which people are born. They have no desire to camp anywhere, its a dying movement, theres not enough of them to hold a camp and should they ever be able to conjure up more than 1,000+ people to march down Pine Street, its a sign to the neighbors living nearby, to board up the windows and lock the doors.